I started my Alaska life as a seasonal worker and usually made my annual migrations via the Alaska Highway. It left me with a love for the route that still lingers, even though I haven't traveled it in more than two decades. Lots of fond memories persist of the scenery, wildlife sightings and the sense of isolation, as well as the lodges, cafes and service stations that drivers encounter at remote spots along stretches lasting sometimes hundreds of miles between communities that are little more than wide spots in the road. I drove the full length five times and stopped in plenty of lodges for gas, surprisingly good food, predictably bad coffee, tire and windshield repair and even a water pump on my most problematic journey. Proprietors ran the gamut from grumpy to gratuitous, but regardless of their temperament, they were always clearly self-sufficient. They had to be. It's a tough place to earn a living. Passing through meant never getting to know the people whose hospitality I appreciated and, on a couple of occasions, depended on. But thanks to author Lily Gontard and photographer Mark Kelly, both of Whitehorse in the Yukon territory, I now have a sense of what brought these people north and what life running an Alaska Highway lodge is like. "Beyond Mile Zero" is a newly published work that originated with photographs Kelly had taken while traveling the highway with his family in 2011. This turned into a published photo essay that focused on abandoned establishments, but evolved, thanks to Gontard's involvement, into an oral history project on the backgrounds of both shuttered and still-existent businesses and the people who make up what the subtitle of this book calls "The Vanishing Alaska Highway Lodge Community." One of the things that becomes apparent while reading this book is that there truly is a community of people operating these lodges. As the book progresses from Mile 0 in Dawson Creek, British Columbia, to the road's terminus in Delta Junction (historically Mile 1,422, but now, thanks to numerous straightening and improvement projects, a paltry Mile 1,387), readers will find several family names popping up repeatedly as owners and/or operators. As people married into and divorced out of these families, they also put their time in at one lodge or another. Gontard digs a bit into the backgrounds of people who came north, often with no intention of entering the lodge business. On the Canadian side, several were trappers or miners who were in the vicinity when the Alaska Highway was built by the U.S. Army as a military road to the northern territory during World War II. Construction camps along the route were abandoned afterward, and these provided the infrastructure for the earliest lodges, which sprang up after the highway was opened to public access in 1948. Tourism came early as people rushed north to visit previously inaccessible regions of Alaska and the Yukon. At the time, cars burned fuel prodigiously so gas stations every 50 miles or so were a necessity. Rooms were also in demand, although as campgrounds were established and more people traveled by RV, this end of the business faded. Food was always appreciated, however, and it was home-cooked at every stop. According to the text, travel along the Alaska Highway reached its peak in the early 1980s, with tourism and resource development booming. These were high times for businesses along the road, but several factors conspired to reduce traffic and squelch many of the establishments. Mineral development tapered off, tour companies started flying clients instead of busing them and automobile manufacturers responded to rising fuel prices. 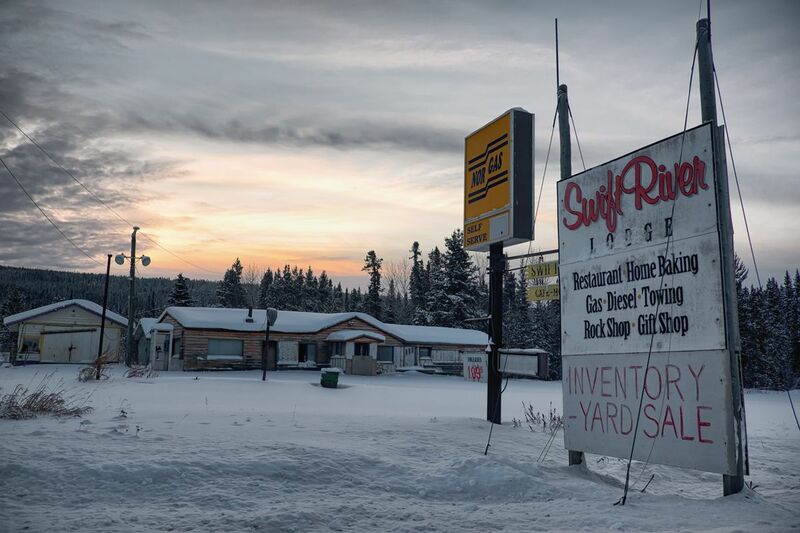 "The heyday of the Alaska Highway lodges was an era of unpaved roads, gas-guzzling vehicles, tour bus traffic and costly airfare," Gontard explains. "The 21st century is a striking contrast, with a paved and chip-sealed highway, fuel-efficient vehicles, fewer tour buses and airlines offering more affordable flights." This caused many of the lodges along the way ­­­— even some I frequented back in the day — to close, and take with them a way of life. Gontard evokes some of it through her interviews, and among the best are the ones with people who grew up the children of lodge owners. Alaska's Warbelow family is well known in aviation circles, but they also owned Cathedral Bluffs Lodge northwest of Tok. Art Warbelow recalls in his interview stopping traffic along the highway as a child so that planes could use it for a landing strip. Gordon Steele, who grew up at Swift River Lodge on the Canadian side, tells a similar story. Regarding their isolated upbringing, Warbelow's sister Cyndie told Gontard, "The more time passes, the more I feel we were incredibly fortunate to be raised in a situation like that. We were remote, but our family was close because of that, and we were exposed to many interesting people. We were very, very lucky." Elsewhere, siblings Aksel Porsild and Ellen Davignon recall growing up at Johnson's Crossing in the Yukon, which Ellen and her husband took over a few years after they were married. The couple closed the lodge and shifted the operation to a bakery and campground. Ellen's cinnamon bun recipe is included. Some of my favorite stops are found here, including Shepherd's Inn at Mile 72, where the pies shouldn't be missed. Toad River Lodge has the second-best sign along the highway (the best goes to the long-closed Lum 'n' Abner's), and at Rancheria Lodge a fox once jumped on the hood of my car while I was stopped after dark. This is a fun book worth stashing alongside the "Milepost" on any trip over the Alaska Highway. The stories, as well as the historic and current photos, give a feel for the stops along the way that will enrich any journey on what remains one of North America's finest drives.